According to a recent report compiled by Transparency Market Research (TMR), the competitors of the global autonomous car market may witness lucrative growth opportunities owing to the technological advancement in the autonomous market. The rise in number of accidents per year have also boosted the market for autonomous cars in the past years, as driverless cars will be running systematically on the road and there will be less chances of accidents caused by machines. Players of the market are leaving no stone unturned to give tough competition to each other. Some of the key vendors of the global autonomous car market are Ford Motor Co., Uber Technologies Inc., the Volvo Group, Toyota Motor Corporation, and Nissan Motor Co. Ltd. Major players are focusing on innovative techniques to create new and unique final products in order to attract more buyers. The more the level of product differentiation, the higher is the degree of competition among vendors. As per the TMR report, the global autonomous car market is estimated to reach 0.60 mn units by the end of 2025. The market is anticipated to expand with a CAGR of 47.50% within the forecast period of 2025 to 2035. On the basis of level of automation, level 3 autonomous cars are expected to generate more revenue as compared to the others. On geographical basis, North America is seen to be dominating the global autonomous care market by the end of the forecast period. The increase in the number of car accidents has led to the demand for autonomous cars in the market, since autonomous cars will have more control on the gears and there is less possibility of accidents Apart from that, the building and construction of smart cities by various country governments have resulted in improved internet connectivity, along with better roads and highway infrastructures. In this way the features of autonomous cars will be more easily displayed and put to use. Thus, the interconnectivity between various markets and their development is ultimately driving the growth of the autonomous car market. Besides that, the rise in demand for electrical vehicles is also accelerating the market at present. Over the past twenty years, the advancement of embedded systems in the automotive industry has surged remarkably because of the deployment of such systems in new in-vehicle infotainment and telematics products for automotive. Thus, demand for automotive embedded systems is propelling the overall market due to the further requirement of operation systems like satellite radio, anti-lock braking system, tire pressure monitoring systems and a lot more. 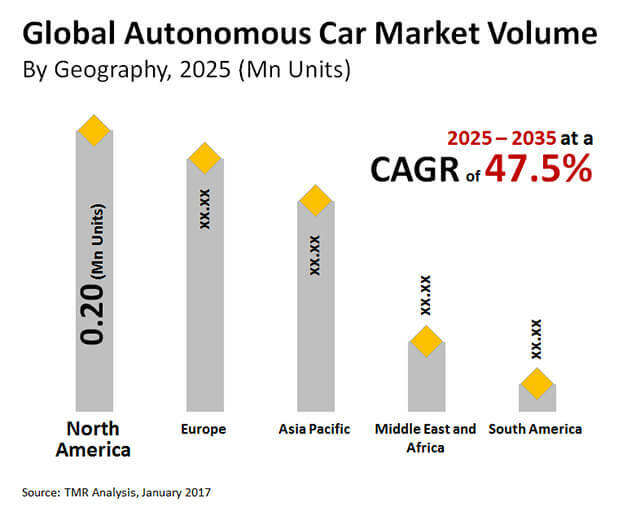 From a geographical perspective, the global autonomous car market is seen to be dominated by the North American region. This is because of the upgrade in autonomous cars that provides lot of benefits like reduction of car emissions by more than 60%, and saving time, money and fuel by sensing traffic in between the journey and finding out faster ways to reach its destination within no time. Other than that, it is also presumed that driverless or autonomous cars will be able to park with less than 15% less space and thus, space saving in terms of car parking. Factors like proper traffic rules imposed by state government may cause confusion among the vehicles used in various countries. As per Indian traffic rules, automobiles are required to drive from the left side of the road while vehicles abroad drive on their right side. As per autonomous cars are concerned, the automatic buildup and set up of cars produced abroad may create chaos for both Indian drivers and roads. This kind of problems may create a hindrance to the overall market for autonomous cars in the near future. However, government efforts to improve all infrastructure and buildup of smart cities may be a new direction to the upcoming era of autonomous cars in future. The information presented in this review is based on a TMR report titled, “Autonomous Car Market (Level of Automation - Level 1, Level 2, Level 3, Level 4 and Level 5) - Global Industry Analysis, Size, Share, Growth, Trends and Forecast 2025 – 2035”.